Every now and then, I share something here on Life with Lynnie (LwL) that is written by a fellow blogger. Today, I'll be doing it. The blog entry I am sharing with you, is posted by Slant Right Christian Blog (SRCB)and the entry is entitled, Muslim Brotherhood Infiltrate America. 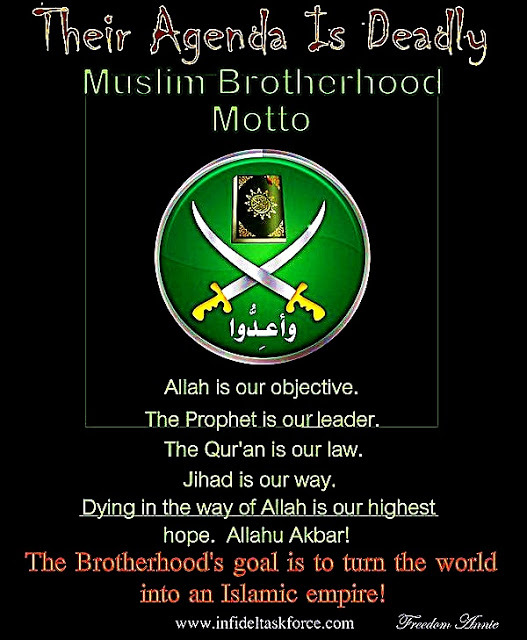 Here is a link you can click on to read the article: http://slantedright2.blogspot.ca/2017/04/muslim-brotherhood-infiltrate-america.html#.WQd1hIWcHmK. I must admit, I like the fact that SRCB speaks truth regarding Islam. Please know that if my blogger system would allow me to add more blog links, I would add it. Hopefully, you clicked on the link I shared. If you did, I thank you. If you didn't click on the link to read it, I'll share with you some things mentioned on the link. Just so you know, the information that was posted, had been e-mailed to the blogger. In this episode, Clarion Project exposes numerous groups such as CAIR, ISNA and the Muslim Students Association that would not condemn 9/11, Hamas and Hezbollah. Their parent group, the Muslim Brotherhood, is responsible for global terror and nurturing many well known terror organizations. In episode 13 of The Third Jihad, Clarion Project exposes numerous groups such as CAIR, ISNA and the Muslim Students Association that would not condemn 9/11, Hamas and Hezbolla. Their parent group, the Muslim Brotherhood, is responsible for global terror and nurturing many well known terror organizations. Here is a YouTube video that is on the article page and is entitled, The Third Jihad - The Muslim Brotherhood: https://www.youtube.com/watch?v=IPGBq4zGVJI. If you watched the video, you will have gained knowledge that Islam is truly trying to convert everyone to become Islamic, including all countries. It mentions that Muslims are doing what they can from within America (meaning USA), rather than placing physical war. What it says about that, is exactly what I've been saying about not just what's happening here in Canada. But, it is also happening in many countries in the world, today. Just like what Muslims did in the past. Like what they did in various countries in South Africa, when Muslims converted, and/or killed people. Some people who were not converting to Islam; left their countries. Some came to Canada... and other countries, because Islam took over and converted not just people, but their countries became Islamic. Not necessarily physically yet, here in Canada. However, the war we are experiencing is basically spiritual. Just like what is happening in USA, and other countries in the world. Yes, I believe we are having tribulation. Just as we read, in John 16:33, "These things I have spoken unto you, that in me ye might have peace. In the world ye shall have tribulation: but be of good cheer; I have overcome the world." Yes, we will have peace, just as our Lord told us in today's Bible verse. We shall have tribulation, just as our Lord told us. But, the most wonderful thing, is that our Lord told us... He has overcome the world. We may not have a perfect life, here on earth. However, if you read God's Word, the Bible, you'll know that not only did Jesus Christ overcome the world, but when we trust in/believe upon Him, we not only gain salvation (Acts 16:31), we can become overcomers, as well.